Background: The oxygen transfer rate and volumetric oxygen transfer coefficient (KLa) are the most important parameters used for the design, operation, and scale-up of bioreactors. In aerobic fermentation processes, continuous supply of oxygen is required due to its low solubility in the growth medium. The gas–liquid mass transfer in a bioprocess is strongly influenced by the hydrodynamic conditions in the bioreactor which, in turn, are due to the type of microorganism be used, media composition and biocatalyst properties. Objectives: The main focus of the present review article is on the use of the oxygen vectors as a better and economical alternate for enhancing oxygen transfer rate during the production of industrially important biomolecules in aerobic bioreactors. 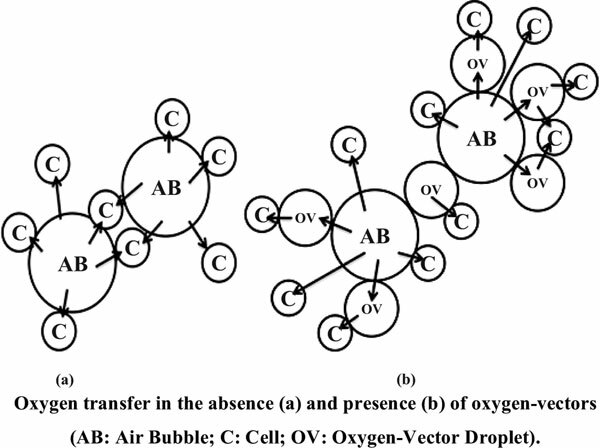 The efficiency of oxygen transfer rate can be enhanced by adding oxygen-vectors in production broths without increasing the energy consumption for aeration. Results: The use of a variety of oxygen vectors with diverse microbial systems has been shown to result in the improvement of bioprocess performance. These organic liquids when used at an optimum concentration enhance the production of bio-molecules of commercial interest. These oxygen vectors only allow the increase in the OTR without interfering with the microbial metabolism due to their relatively inert and nontoxic nature. Conclusion: Much attention is required in the design and development of improved and efficient large-scale aerobic fermentation processes with the use of these oxygen carriers. The major factors which favour the economics and cost-effectiveness, include optimization of oxygen vector concentration, their compatibility with particular microorganism and suitable time for their addition. Moreover, the antifoaming action of oxygen vectors is the additional feature that makes them more suitable for use in aerobic fermentations. Aerobic bioprocess, KLa, oxygen vectors, oxygen transfer rate, aeration, fermentation.